Although summer is in full swing, we all know that August is just around the corner and school will begin soon thereafter! I feel like a killjoy for bringing this up, but I know from experience that now is a great time to work on a few of those back to school to-dos! Instead of waiting until the last minute, why not check a few of them off the list? 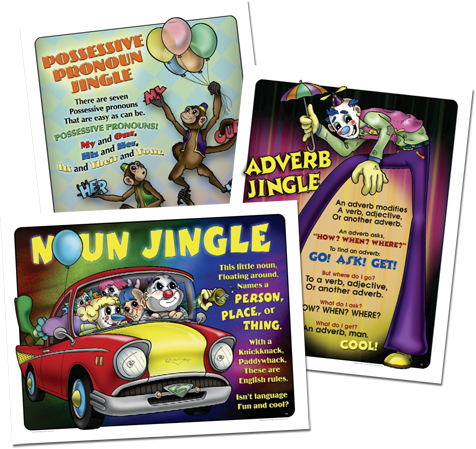 This week, I would like to focus on selecting and positioning Shurley English Jingle Posters in your classroom! Shurley English Jingle Posters are available to purchase. They are 17” x 22” each and provide a colorful visual aid to assist students’ learning. The posters are great tools for reinforcing grammar concepts taught using the curriculum, especially when they are displayed properly. Your students can join the lovable Quigley character as he escorts them through the adventures of grammar if you choose to buy the posters! Another option is to create your own Shurley English Jingle Posters. Since Jingles are located in the Quick Reference section of the teacher’s manual or student book, all you have to do is copy them into your own design and VIOLA! Ideas for how to create your own posters are endless, so if you have a theme in your classroom, use it. motivate and inspire students to learn. stimulate interest in the topic. effectively illustrate a concept or skill. Jingles are an essential element of Shurley English. They not only teach and reinforce important skills and definitions; they help transition students’ brains into a ready-for-learning state of mind at the beginning of class. Researchers report that the visual sense is responsible for 90% of brain stimulation and that vision and visual memory take up to two-thirds of the brain. Those findings substantiate how educational posters can truly assist students’ learning. It’s easy to get overwhelmed with items on your classroom to-do list, especially if you wait until the last minute. So, get Shurley English Jingle Posters on your mind and either purchase them or start creating them. Either way, they serve as an effective learning tool all year long!